The Museum of Drugs is a Registered Charity (1181946) in the UK and an internationally renowned authority on the history of substance use. With a growing collection of artifacts, which describe the historical context of human relations with psychoactive substance, the Museum acts as a resource to academics, researchers, writers, students, the television and film industry, and the general public. In addition, the Museum has supported the promotion of a range of film and book projects, delivered training on current drugs policy within the context of a historical narrative, and provided presentations and lectures on the subject of substance use history and legislation. Drug use is a complex and multi faceted aspect of the human experience and one that continues to devide opinion. The Museum of Drugs acts as a resource to encourage debate and support greater understanding of this contentious issue. The Museum of Drugs neither advocates or condemns the use of drugs, rather we accept that it is part of our evolution. Where drug use is problematic we would encourage harm reduction approaches and advise individuals to get the support that they need. Ben has worked in learning disabilities, mental health and substance use services since graduating in Psychology in 1995. More recently he has worked for the third sector within assertive outreach, operational management and business development. His experience of delivering training on substance use policy and as a guest lecturer at university led to the creation of the Museum of Drugs, the primary purpose being to bring the historical context of drug legislation to a wider audience. 'Understanding the present is about understanding our past. Without this ability we are incapable of building a better future'. Dan has spent twenty years working in substance misuse and mental health as a practitioner and senior manager. He is currently the chief executive of a youth charity. He is also an occasional university lecturer and trainer. Dan's role at the Museum of Drugs is advisory and strategic. He is keen to see the museum attract a range of visitors including policy makers and academics. Dan notes 'The museum is an opportunity to understand the history and context of drug use and how moral panics, fear and ignorance has influenced social policy and legislation'. Emmeline has extensive experience working in the public and third sector. She has provided consultancy in management and leadership to a variety of organisations, and is currently the chief executive of a charity supporting socially marginalised groups. The Museum of Drugs is wholly reliant on grants and donations. All of the funding that we receive is used to further develop the collection and resources of the Museum and therefore we are extremely grateful to those people and organisations that have contributed to our important work. 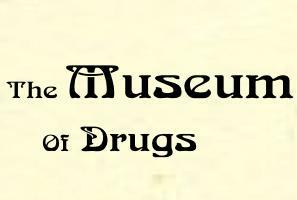 If you would like to make a donation to the Museum of Drugs, you can do so in a variety of ways. We accept donations of historical artefacts alongside more recent items of interest. If you would like to donate items or collections to the Museum, we would love to here from you. We also accept financial donations and grants.